Concealed brass Urinal Flush Valve with adjustable screw for water flow, easy to install and operate. Time control flush valves for urinal, press button to get water, flushing 3 to 8 seconds, automatic closed, saving water. 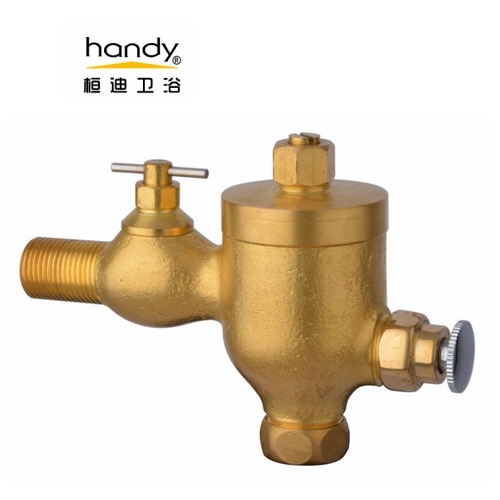 Brass body construction, durable piston and spring ensure durability and reliability for the life of urinal Flush Valve. 1) Please clean the inside of plumbing, like mud or sandy etc before install this Urinal flush valve. 2) This product is passed function test, please don`t dismantle the self closing valve core, you can be sure to use it. Looking for ideal Brass Urinal Flush Valve Manufacturer & supplier ? We have a wide selection at great prices to help you get creative. All the Concealed Urinal Flush Valve are quality guaranteed. We are China Origin Factory of Urinal Flushing System. If you have any question, please feel free to contact us.